I was trained as a physician and practised for five years before devoting myself full-time to art in 1991. I became obsessed with the challenge of connecting a stepper motor to the parallel port of my PC in 1990. This led shortly after to my first CNC art robot being Eggbot (now an open source project overseen by EvilMadScientist.com). I love algorithmic processes and math. 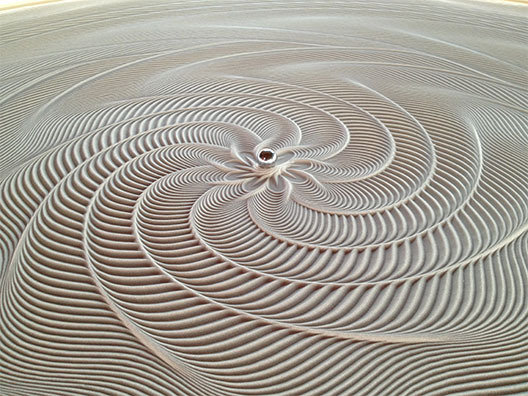 I wanted to create algorithmic sculptures and CNC tools were the clear choice. So now I am a motion control artist, exploring this industrial technology to create art. 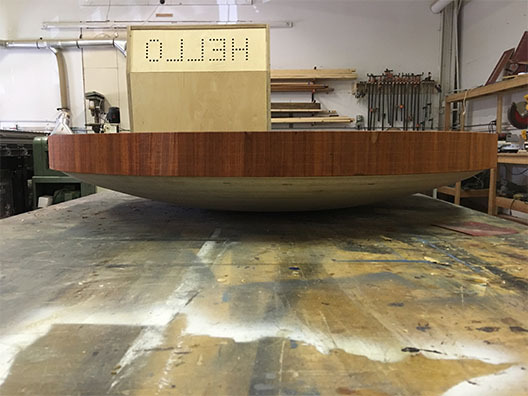 My business – Sisyphus Industries LLC – was created shortly after we launched a Kickstarter campaign for “Sisyphus – the Kinetic Art Table” in September of 2016. 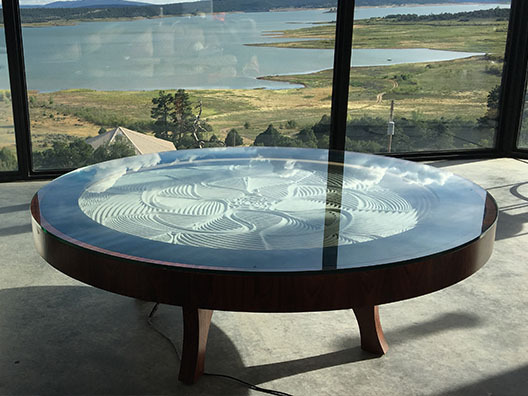 It is basically a 2-axis, polar geometry sand plotter housed within a glass-topped table. For hardware I use CNC: routing, milling, laser cutting, engraving and 3D printing. Modifications to CNC? This is in essence what I do. 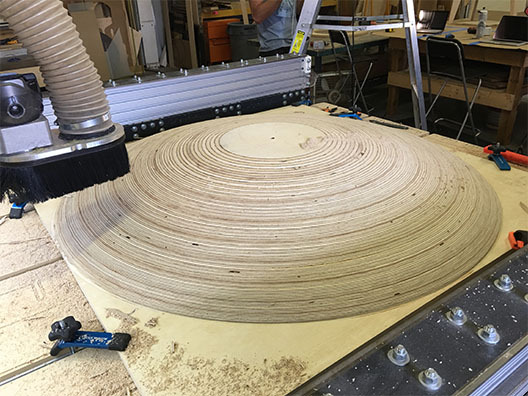 Sisyphus is nothing more than a customized CNC designed to live within the home. I grew out of my history of building my own CNC tools (engraver, plasma cutter, mill) during the 1990's. Software? Because of the nature of my art I use a selection of design and manufacturing software packages, some of which include; AutoCAD, Solid Works, Fusion 360, VCarve Pro, Mach 3, WinCNC and LaserCut. 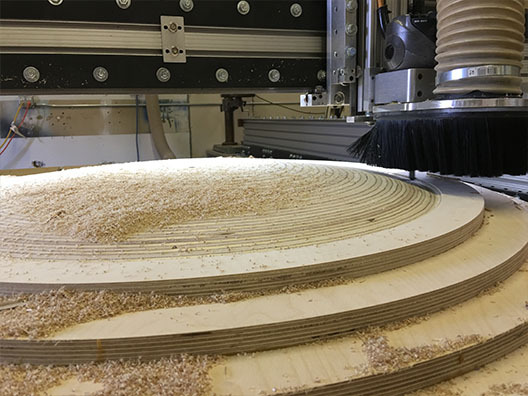 I started using Vectric’s VCarve software in a makerspace in Minneapolis around 2012, one thing that stood out to me about the software was the ease of generating toolpaths. I've been working on the Sisyphus project since 1998. I began developing the “home version” inside tables, about four years ago. From my website I enable customers to customize their order of the Sisyphus so this changes the materials used depending on the request. The wood and metal I use are sourced locally. For the internal materials I use stepper motors, circuit boards and tempered glass which all come from China. Just like the materials, the tooling used for each individual order can vary quite significantly. I use a wide variety of carbide bits from 1/16” diameter to ¾”. What I found that really helped was how easily I was able to create, generate and run the 2.5D toolpaths I needed with VCarve Pro. What I found that worked out really well was the 1000’s of hours I invested to get to the final design. I went through hundreds of experiments and tweaks – this was definitely worth every minute. However, this wasn’t a smooth journey and one thing I would do differently is to not be so impatient – easier said than done I know. Anyone would think that the creative process is the most enjoyable aspect of Sisyphus, but for me its not. The most enjoyable aspect of the whole journey is getting feedback from some of the more than 800 people who have received their Sisyphus tables to date. We plan to continue fabrication of our art-tables, improving them along the way. We hope to expand our business to fill pent up demand. But as of right now, we are in the process of creating the remainder of the kickstart pre-orders – we just passed the half-way point.